Review - RotarySwing.com - Does this System work? When it comes to golf instruction the internet has definitely changed a couple of things. There seems to be more material than you could ever absorb in a lifetime. And you can find a lot of contradicting instruction and golf tips if you take a look around. So the question remains if you can improve your swing with the help of online tutorials and videos? One of the oldest websites that offers golf video tutorials is www.rotaryswing.com. The site was founded by the golf instructor Chuck Quinton in 2004 and claims to offer “Step-by-Step Instruction to a Biomechanically Perfect Golf Swing”. This article is an honest review of the site telling you my opinion about the free and paid membership levels, what they have to offer and if it’s worth to invest your time and money into the program. 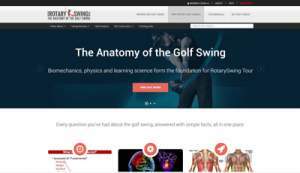 Rotary Swing claims to teach you a biomechanichaly correct golf swing. Can they live up to their own hype? When you take a first look at the site you are bombarded with a lot of hypie marketing claims like “easy to follow path to an effortless, powerful, and pain-free swing” or “Best Online Golf Instruction”. But can Rotaryswing.com keep their promises for a change? The design of the site is professional and everything is clear, readable and easy to navigate. Unfortunately you can’t really get an impression of the content before you’ve set up an account. You can create a new account fast and easy with any e-mail. If you join you’ll receive a couple of e-mails but nothing more. So no spam. That’s good. If you take a look inside with the free membership you’ll get nagged about joining the paid membership pretty fast. But that was to be expected. Once you’ve signed in you’ll get access to the limited free content and will be constantly teased to try out the paid membership. 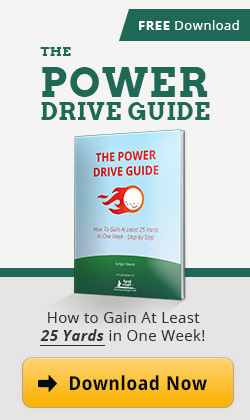 With your free membership you’ll get access to a couple of videos and one free swing analysis. I think the free content is too limited to get a good impression of the system but I can also understand that they don’t want to give away everything for free. 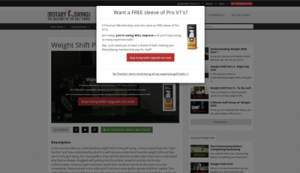 The free video swing analysis is a nice bonus and a clever hookup to convince you to buy a paid membership. If you don’t decide to invest in the paid membership you’ll go through the content pretty fast and get some general concepts about what Rotaryswing tries to accomplish with it’s systematic approach. Not much more to talk about here. The free membership is obviously just a teaser for the paid membership and doesn’t give away a lot. But who expected anything else? The swing analysis of your golf swing is great value for your paid membership. At a very reasonably price of $19.97 per month they offer a lot of content that accumulated over the years. Plus each paid member is able to send in two videos of their swing each month for review and analysis to accelerate their learning. These video swing reviews are very valuable and worth the price of admission alone in my opinion. If you send in your swing you get a personal video as a response within a couple of days. Although the analysis videos are only a couple of minutes long you always get some detailed aspects and hints on how you can better your swing on your own. The submission process of your videos can be a little cumbersome but you get the hang of it after doing it a couple of times. Each section contains several videos and builds on each other. The videos are very straight forward and have no fluff or entertainment but they aren’t dry. They either teach you some concepts or give you some drills to use on your own time. 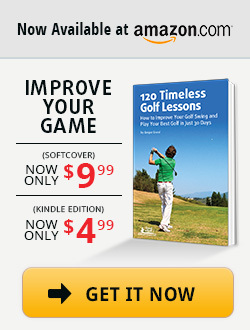 You also get some bonus sections that deal with hitting the driver, golf fitness and faults and fixes. Overall there are easily 10 hours of video tutorials to watch if you want to absorb everything. I think you get the most out of the site if you go through the content in order and send in your swing for your reviews on a regular basis. This requires a lot of effort on your part, of course. But I think it’s absolutly worth it. I also think that the system is great for refining your swing during the off season or for rainy days when you are unable to hit the course. Most of the drills can be done in the comfort of your own home and you don’t even need to swing a club neccessarely as they try to teach you seperate motions on a step-by-step basis. Here’s a short introduction to the program of RotarySwing.com. The founder Chuck Quinton talks about the key points of his program and what the main differences to other programs, videos and books are. Can you learn a sound golf swing with Rotaryswing alone? I’d say yes and no. It honestly depends what your swing faults are and what type of learning style you prefer. Some people do great with videos and drills. Other people just need a professional golf instructor that can interact with them and bend them into the positions they need to feel. Especially if you are a low handicapper you probably need personal instruction to get the details right that can bring you to the next level. Remote diagnosis just doesn’t cut it there. In general I’d say that RotarySwing.com can definitely help most high to mid handicappers to play better if they invest the time, do the drills and go through the system step by step. You get a good understanding of what makes up a functional golf swing, what factors control the club face and what you need to focus on to gain better control over your shots. The biggest crux of the system is that you need to be very diligent to benefit from it. As with anything in golf you get out of it what you put into it. On top the system is heavily biased on the full swing. There’s only little information on putting and the short game. Doesn’t The System Screw Up My Natural Swing? The thing about Rotary Swing is that they try to teach general concepts – yet are very precise with their instruction. This may seem like a contradiction. And at first the instruction videos and drills seem like monkey see monkey do. But once you’ve mastered a couple of the moves you’ll get the idea that they are only teaching general elements of the golf swing and leave more than enough room for your individual nuances. I think they do a great job of teaching you what, why and how to accomplish certain things in your golf swing without being too dogmatic about it. They try to sell you the idea more than once that they are teaching the anatomical perfect golf swing that prevents injuries and is the way to go. And without a doubt you will find certain instructions that contradict other golf instructors and golf books. This style may not be for everybody especially if you are used to play more by feel and like to grind it out. People who like to have a clear path they can folow can benefit greatly from the RotarySwing System, though. RotarySwing.com is a great website if you want to learn a functional golf swing and like a systematic approach that you can follow on your own time. You still need to to go through the content, do the drills and upload your swings for review to see good results. Don’t expect something from nothing. Step 3: If you like what you see. Sign up for a paid membership and benefit from your swing analysis every month. I earn a small commission with every paid membership that results through a link from my site. That being said I kept this review as honest as possible and I wouldn’t promote Rotary Swing if I wasn’t fully convinced that the content and service could help you to play better golf. I wasn’t paid to write this review and it reflects my personal and honest opinion. If you are still on the fence just try out the free membership and check Rotary Swing out for yourself. You’ve got nothing to lose here. Sign up for our free email newsletter (Good at Golf Academy). It is jam-packed with the best golf instruction insights: Including "Road to Scratch", "Long Drive Champion Secrets", "Consistency Blueprints" and "The Big Lesson From the Lesson Tee". An email with a confirmation link was sent to your email. Please follow the instruction in that email to confirm your free subscription. I’ll disagree with your assessment on one point. I believe low handicappers can also benefit from the RST site. My last index was 3.6 but my swing got out of whack and I’ve been looking for answers. After several in person lessons from different instructors I was still confused and in the process confirmed Chuck’s statement that different instructors often contradict each other. But when I signed up as a member on the RST site and sifted through the wealth of information there I found exactly what I needed to diagnose and cure what was ailing my swing along with the “why” for every “how”. Having a source for accurate and reliable information is worth a lot to me — more than what they charge. Glad you found what you were looking for. My experience is that low handicappers usually have to tweak tiny things instead of broader strokes in their game. In person coaching (on the range and golf course) is the best way to approach this in my experience.